These are my parents. This photo was taken in May 2017 exactly 2 weeks before my father almost died of septic shock. Despite their age and physical limitations, my parents had traveled alone from California to Wisconsin for a family wedding. At this point, my father had already survived numerous health crises. Two weeks after this family wedding, my father had his gallbladder removed. Two days later his fever spiked and his blood pressure fell. We all thought we’d lose him. To better understand this story, I need to go back a few years. Following my mother’s knee replacement, her scoliosis became marked worse causing her gait to be altered and her balance to be affected. Over the next few years, she began to move slower and slower. Then, we all noticed that her short-term memory was beginning to fade. Then she suffered a minor stroke. The MRI and CT scans showed cerebral amyloid angiopathy (CAA) and that my mother had 12-15 prior brain bleeds. While at this family wedding, my father asked us what they should do. Because my father had planned ahead, my mother owned a long-term care insurance policy. We encouraged him to start the claims process for my mother. The plan was to provide my mother with home health care standby assistance for bathing and dressing. Before my father could make the call to start the process, he developed double pneumonia and sepsis from routine gallbladder surgery. Needless-to-say, he almost died. In the span of a few hours, my father went from being completely independent to not able to get himself out of bed. 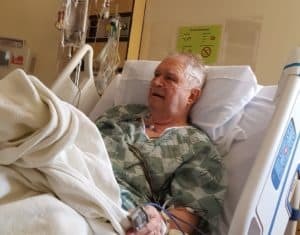 While he was still in the hospital, I dug out their long-term care insurance policy and met with Amada Senior Care, a home health care company that assists with the filing of insurance claims. Since they purchased their policy in 2006, I hadn’t given it much thought. I was pleasantly surprised to learn that my mother had used the future purchase option to buy more coverage and her modest policy had grown to be $344 per day over 3 years. This amounts to $10,320 per month in benefit for 3 years, totaling over $376,000 of benefits. I knew that this policy would be more than adequate to cover the care my mother needed. Not only did my mother need assistance with bathing, dressing and daily walks, but my father needed someone available 24/7 due to his weakened condition. Because my mother’s long-term care insurance policy has a 90 service day elimination period, Amada Senior Care was going to be billing the care separately for each of my parents. Miraculously, my father recovered from the infections, although he was weaker than he was prior to the infection. Because we all saw firsthand how quickly things can change, my parents made the decision to move to an assisted living facility. My father had made it his life’s ambition to care for my mother. Because of her delicate condition, he wanted to ensure that she was in a good place should something suddenly happen to him again. We were able to counsel my parents and assist them with this life-altering decision without too much thought to the cost of care because of my mother’s long-term care insurance policy. We had peace of mind knowing that my mother would have the care she needed as she got older, lost more memory, or her mobility continued to decline. We had peace of mind knowing that if something happened to my father and he needed care, it wouldn’t affect my mother’s care. If you watched the video above, you know that my father passed away peacefully in his sleep 6 days after they moved into the assisted living facility. The paramedics and staff were still in the apartment waiting for the mortuary when my mother asked if she would have to move. Because of her long-term care insurance policy, I was able to confidently tell her that she will never need to move. I am so grateful to my father for buying my mother’s coverage. It has made the last 20 months since his passing so much easier for my mother, and for me as her caretaker. Thanks, Dad.